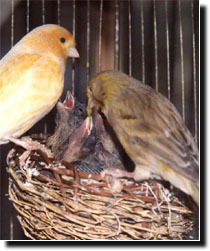 but Fledglings are the most susceptible. able to do anything to save them. Giardiasis (GEE-are-DYE-uh-sis) is a diarrheal illness caused by a one-celled, microscopic parasite, i.e., a protozoa, that moves with the aid of five flagella. Also know as Giardia lamblia. Once a bird, animal or person has been infected with Giardia intestinalis, the parasite lives in the intestine and is passed in the stool. Because the parasite is protected by an outer shell, it can survive outside the body and in the environment for long periods of time. How do you get Giardia and how is it spread? Giardia is found in soil, food, water, or surfaces that have been contaminated with the feces from infected humans or animals. During the past 2 decades, Giardia infection has become recognized as one of the most common causes of waterborne disease (found in both drinking and recreational water) in humans in the United States. Our domestic drinking water carries this parasite. The safest way to protect your birds is to boil their drinking water or use a reverse osmosis system in your home that filters their drinking water. 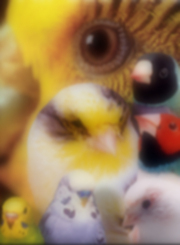 When traveling to a bird mart, it�s always best to use bottled water, to drink and for cleaning drinkers and feeders. 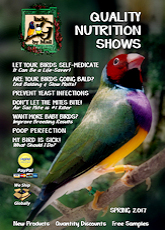 This is not only good advice for your birds but for your own health as well. Because Giardia can be difficult to diagnose, your vet may ask you to submit several stool specimens over several days. Giardia infection can cause a variety of symptoms, which include: diarrhea, weight loss, poor appetite and dehydration. You can prevent your fledglings from dying during the next breeding season by treating with (Ronidozole) Ronivet-S protozoa treatment. Always use distilled water when administering medication. Treat for 7 days with the Ronivet-S. After the 7day treatment if the birds do not appear improved repeat the treatment. For particularly difficult infections, increase dose 4 times normal for 3 days, then continue with normal dose for 4 days. 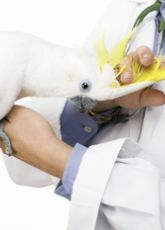 Treat your birds for a total of 14 days, if necessary, with a 7 day interval between treatment times. Treatment will be administered over a 21 day period. The reason for this is that the protozoa reproductive cycle varies at different stages so this way you are sure to get all of them. Are your birds drinking the water? Some birds can taste the difference in their water and not drink when a medicine is added. If this happens, you can add a little apple juice to sweeten the water. Hold all fruits and veggies for the days you are treating. Birds will drink much less of the medicated water if you offer moist foods on the days of treatment. How do I prevent Giardia infection? Wash hands thoroughly with soap and water before working with your birds. Wash (distilled water) or peal all raw vegetables and fruits before feeding. Clean hard surfaces, drinkers and feeders with Pet Focus disinfectant. Use distilled water for your birds drinking water.